Offering you a complete choice of products which include mackintosh rubber sheets. We are one of the largest manufacturer of Mackintosh Rubber Sheets, also known as Hospital Rubber Cloth or simply Rubber Cloth, Hospital Sheeting or Hospital Rubber Sheeting. Our annual production of 10 lakh linear meters is able to cater to the requirements of various companies. 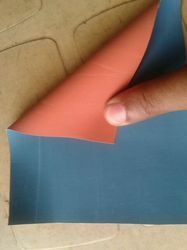 Available in colors like– Red/Red, Red/Blue, Red/Green, Red/White and other colors as per the clients request, our rubber sheets are durable and washable. Moreover, our range is commonly available in widths of 90 cm and 110 cm. However, we can also fabricate these in widths up to 150 cm. These are also available in various sizes like (90 cm X 75 cm, 100 cm X 150 cm, 24” X 24”, 100 cm X 200 cm). Custom designed on the basis of color, thickness, length or rolls and width, these are widely demanded by our national and international clients. We are also BIS certified for this hospital rubber sheeting and holding the prestigious BIS licence for this product. We also manufacture as per IS 4135:1974 with ISI marking. Looking for Mackintosh Rubber Sheets ?